I am so happy I have been given the opportunity to review the Groove Kid Nation cd. We are going through a huge music phase with our toddler. All the children’s music out there all kind of sounds the same. The same songs and beats are used over and over with different words. And after a while my whole family has just become very tired of the same old songs. My son is already tired of all those “baby” songs. He actually requests the radio in the car, but those songs are just not appropriate for him. That is why I was so happy when I put the Groove Kid Nation Kids Songs cd in. The moment we popped in our new kid’s songs the whole family fell in love. The songs are fun, different and so funky! One of the best things about these kid’s songs is the exposure to different sounds. There are a lot of different instruments introduced that you don’t hear very often. Instruments like the slide trombone, tenor saxophone and the flute. My husband was very relieved when he heard the new kid’s songs, he was bobbing his head and grooving to the beat! We were able to discuss music and instruments; it brought on a whole new learning opportunity for our son. Needless to say we have really enjoyed the music. 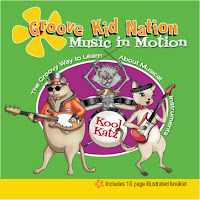 Groove Kid Nation also includes a 12 page illustrated booklet so your kids have a chance to see all the instruments too. We try to find the instruments in the booklet that match the songs we are listening too. Overall, if your kids/family love music you should definitely give Music in Motion kids songs a listen! Here is a little information from the creator of Groove Kid Nation along with his reason for creating such fun groovy music for kids. “Groove Kid Nation is an educational children's music label whose goal is to introduce toddlers to the sound of real musical instruments. 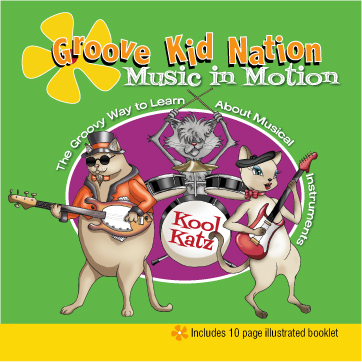 Click here to purchase your copy of Groove Kid Nation kid songs. Also available on itunes and amazon! Thanks for stopping by and linking up at my Lovin' The Weekend Blog Hops. We are also reviewing this CD. My girls just love it and keep asking to have it played. Following you from the blog hop - please follow back - have a wonderful weekend! Hi! Thanks for the review. My little guy loves music during his play time.